Car, bus and train...then bus again. Amtrak trains and Peter Pan buses serve Springfield, the transportation nexus of central Massachusetts, 26 miles south of Amherst (map). From Springfield you can make your way to Amherst by buses of the Pioneer Valley Transportation Authority. Follow MA Route 9 east from Northampton, or I-391 and MA Route 116 north from the Mass. Turnpike (I-90). 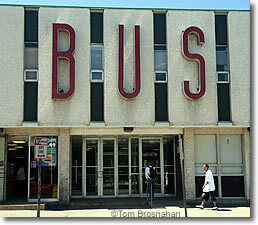 Peter Pan bus terminal in Springfield MA, the transportation nexus for Pioneer Valley.